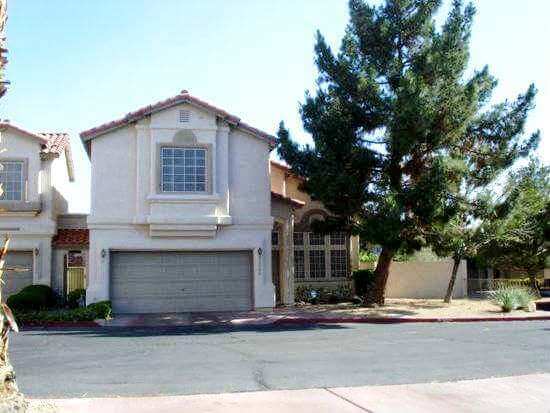 Las Vegas townhomes for sale are like single-family homes, but with one or more walls in common with the neighbor and many, especially in age-restricted sub-divisions only share a garage wall. In both cases, the owner owns the land. Townhomes are treated like single-family homes by banks and restrictions imposed by lenders on financing a condo do not apply to townhouses. The majority of townhouses are two-story buildings with living areas on the first floor and bedrooms on the second floor. However, we have some condos that are just like that but townhouses don’t have any neighbors on top or below them. In age-restricted communities, they are single story. Newer townhouses come with an attached garage, however, older units either have a carport or the garage is not attached to the unit. Older townhome communities generally have fewer amenities than condo projects along with lower Home Owner Association (HOA) fees. However, most newer projects come with full amenities which is reflected in HOA fees. The Realtor association monthly publication that is used by most other Realtors or newspapers mixes the townhome data with the condo data and provides one median price for both which is wrong. So we are providing you with our own Las Vegas townhome market report since the real estate recovery of 2012. In this report, we discuss the reasons for unbelievable price gains since January 2016. The townhome above is in the Legacy Courtyard Condo sub-division. If this unit wasn’t connected to the neighboring garage it would be a single family home. However, if you want to finance a mortgage, you have to meet all condo financing requirements because it is registered as a condo with Clark County. Care should be taken while making an offer on these to make sure that they are FHA approved or financing them will be very difficult. One of the biggest differences between condos and townhomes is supposed to be maintenance. In many townhouse communities, especially the age-restricted communities, the HOA takes care of the exterior of the building, roof, as well as all common areas just like condos. Buyers need to check with the HOA about who is responsible for the maintenance of the exterior as well as the front yard. Buyers can greatly increase the chances of getting a good deal on their townhouse by watching the videos that we have provided in the home buying tutorials series. We start with a realistic example of is it better to buy or rent in the current Las Vegas real estate market. Continuing with the best way to search MLS, townhome financing, making offers and finally escrow process to close your deal. We have dedicated pages for those who want to buy foreclosures, short sales or buying from real estate auctions as well, you can find the links above. We hope that you find our page about Las Vegas townhomes for sale buying guide useful. If you are planning to buy a unit, call us at 702-478-7800 and we will be happy to help you get a great deal and close it without any complications. One of a kind one story showplace in popular La Mancha complete with gated courtyard entry! Amazing White Washed real wood flooring throughout and matching custom cabinets in kitchen. Over 1700 sq feet of updated gorgeousness! Gated complex, mature landscape and pool/spa/clubhouse. 3rd bedroom no closet being used as den, has built in office. Yes, that is a sauna in the den. This is a beautiful 3 bed, 3 bath, 2 car garage with a den. All new paint and carpet. Includes a water softener, central vacuum system and built in book shelves. Located in a gated community with a pool! All furnishings available as well. Pride of home ownership in Green Valley. Gate and highly desirable schools. Close to master plan amenities & association clubhouse & pool. 3 generous bedrooms,master bedroom downstairs plus huge loft., includes fridge, washer & dryer, covered patio,2 car garage, Highly decorated 2 story with master down, nearby parks, shopping and highways and more. A former model in the lovely Stone Canyon. GREAT location of Green Valley. Newer water heater (2016) and A/C motor. Freshly painted. 3 bedroom 2.5 bath with walk-in master closet. Beautiful enclosed yard with patio. Carpet and wood flooring. Laundry room with full-size washer/dryer. 1 car attached garage. Community pool and exercise room right across the street. Very nice, warm and inviting split-level townhome located in the La Dolce Vita community. Private, fully-enclosed yard with mature landscaping and nice shade for our warm days to come. Inside, the home has newer carpet, paint, upgraded tile counters in the kitchen, fireplace and more. The location is convenient to schools, parks, library and other fun things Boulder City has to offer year-round. Welcome to your new Beautiful 2 Story Townhome. Gated Community. Home has only been lived in for a little over 8 months by 1 person. Gorgeous 3 Bedroom, 2.5 Bath Townhome with a 2 Car Attached Garage. Spacious Kitchen with Pantry, Eat In Kitchen Area, Breakfast Bar, & Recessed Lighting. This home is bright and open. Great Room with Slider out to Backyard Covered Patio, Large Yard. Master Boasts a Slider Out To Balcony. Community Park, Playground, BBQ Area, and Community POOL. Gorgeous 2 bedroom/2 bathroom townhome with one car garage, balcony and fireplace. Unit faces east for morning light. Kitchen features Samsung Self Cleaning Oven and Convection Oven with Warming Drawer and Ultra Quiet Bosch Dishwasher. Carpeting 2 years old and home is in great condition. All appliances stay including garage fridge. Beautiful turnkey townhome near shopping, restaurants, freeways, parks and so much more! You will love the rooftop deck with views of the entire city. Downstairs bedroom for easy access. Stunning and spacious kitchen and family room. *GORGEOUS HOME IN GREEN VALLEY RANCH* HOME FEATURES 2 MASTER BEDROOMS, LOFT, 3 FULL BATHS, GRANITE COUNTERS & SUBWAY TITLE BACKSPLASH IN KITCHEN, SHUTTERS, NEW LIGHTING & CEILING FANS, NEW KITCHEN & BATHROOM HARDWARE, APPLIANCES, WIRED FOR SURROUND SOUND & ALARM, EPOXY FLOOR AND LOFT SHELVING IN GARAGE. Lovely & spacious town home in nice community w attached 2 car garage! Huge living area for entertaining. Features 3BR/2.5BA w 1811 square feet. Chef's kitchen w granite counter tops, tile flooring, ample cabinet & counter space. Huge master bedroom w a large walk in closet and beautiful bath w separate tub and shower & double sinks. Desirable La Dolce Vita townhome recenty remodeled. Nice size living room with gas fireplace. Two bedrooms, two baths and a private yard for your enjoyment. Newer tile flooring, carpet, paint and blinds. Both bathrooms have been renovated. Spacious laundry room and brand new water heater Balcony has stairs leading down to the back yard.